“Vroom, rrrRRRRR!” says five-year-old Francisco, turning the imaginary steering wheel of his bus. He’s sitting in a kitchen chair, with his younger sister Ana in a chair behind him. But Francisco and Ana are not in the kitchen — at least not in their own minds. They’re on a bus. “Uh-oh, it’s bumpy!” Francisco cries out, as he jerks his body and rocks back and forth. Ana jerks around with him and eventually they fall off their chairs together, laughing. Francisco and Ana are engaged in pretend play. They’re not just “having fun.” They’re creating a world with rules and acting out roles in that world. After they’ve finished laughing, they climb back on the bus. Francisco starts driving again. Ana suddenly climbs down off her seat. “You can’t jump off the bus when it’s moving!” Francisco protests. “But I want to drive now,” Ana replies. “OK,” Ana agrees, climbing back into her seat. Self-regulation. They’re learning to play roles, just as adults do every day. Language. They’re communicating and negotiating about things that are important to them. Impulse control. Ana wants to drive, but she has to wait until the bus stops. The beginnings of abstract thinking. Francisco and Ana are assigning meanings to objects — such as kitchen chairs — that the objects themselves don’t inherently have. This is an early form of abstract thinking. 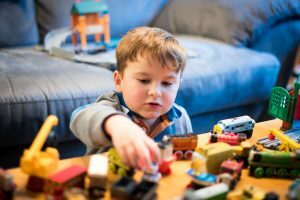 Pretend play is a powerful learning experience because children are learning skills naturally while focusing on activities of their own choosing. During pretend play, adults can provide valuable support to children, but things go south quickly if they try to direct it. The children are in charge. Pretend play is not only fun, it’s fantastic for learning! Watch this two-minute video of preschool-age children playing to get a sense of what pretend play looks like as children are just beginning to develop play-related skills. John Medina, Brain Rules for Baby, pp. 131–132.